DID YOU KNOW THAT CONTINUOUS TRAINING CAN LEAD TO 50% HIGHER NET SALES PER EMPLOYEE? One of our leading digital advertising partners was well aware of the value of training — with hundreds of sales people around the globe, foundational sales skill training plays a critical role in the growth and culture of their organization. After bringing us in for several successful Communication Skills trainings, they approached us looking for an innovative and effective way to better train their sales employees. Over the course of their Q3 sales cycle, we worked hand-in-hand with the organization’s managers to develop a tailored sales training with real results. This particular training threw some big but exciting challenges our way. Our partner realized their previous training program suffered from framework overload. Their managers lamented that “multiple complex frameworks have not stuck and are not sufficiently tailored to our unique culture and goals around customer-first, enterprise selling.” They needed a training that was easy to follow, memorable, and complementary to a culture of customer-first engagement. Our partner also needed a way to ensure quality and consistency in all customer interactions, despite having sales offices around the globe and employees at all career and skill levels. Delivery of their existing sales program varied greatly across regions, creating inconsistency in skill levels, application and program awareness and adoption. Lastly, our partner felt that their existing sales program didn’t incorporate sufficient engagement and interaction. It was too framework-focused, causing skill development and clear takeaways to get lost in the complexity. We collaborated directly with our partner’s sales leads and managers to implement a customized Own The Room Sales Catalyst training. We shifted away from their existing, complex sales frameworks and prioritized the specific sales skills that were most important to their team. We then aligned those skills to their organization’s sales cycle & engagement model to create a more consistent and unified approach that could be implemented globally. What resulted was a Sales Catalyst training tailored to our customer’s specific needs. The one-day program was fast-paced, skill-based and highly interactive with managers acting as coaches, sellers leaving with tools they could apply immediately, and practice exercises they could use after leaving the training. Sales Catalyst kicked off with quick and engaging Circuit Training, getting participants on their feet and familiar with the Own The Room methodology. We then covered several experiential modules, focused on our partner’s learning objectives. These included Client Cartography, Consultative Selling, and Securing Commitment (you can learn more about those here). It’s not an easy task to overhaul a global organization’s sales skills learning program. As with all of our customers, we approached this process as a long-term partner, making sure our training aligned with their needs, culture and vision. Over the course of one quarter, we hosted 13 training sessions across six offices around the world (from Austin, TX to Singapore and Dublin)! We started with a focus on Sales Managers so they could serve as internal coaches going forward, but we made sure to develop a solution that worked for varying levels of career and sales experience. As we moved through the quarter, we incorporated learnings and feedback from prior sessions so the program could continuously improve. By the end of this process, we successfully trained 200 global sales employees. At the end of this program, 94% of the participants said they would recommend the training to others. We asked sellers at the start of the training to choose the one sales skill they wanted to improve during the course. Structure (24% of respondents) was number one, followed by Discipline (15%) and Conversational Intelligence (14%). When the program wrapped, 84% of respondents agreed or strongly agreed that the course helped them improve in their selected skill. 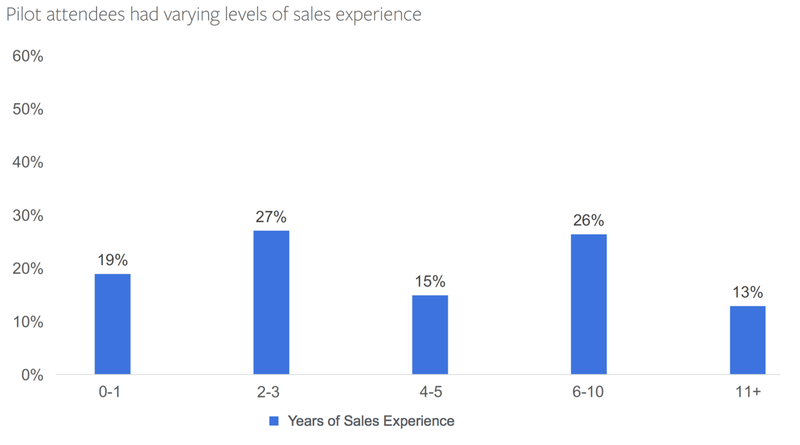 Both new and experienced sellers valued the course, and recommendation ratings & feedback were positive across both overall sales tenure and sales tenure at the organization. This confirmed that Sales Catalyst was applicable and impactful for all of our partner’s sales staff, from junior employees to experienced sales managers. Investing in your people can have a hugely positive impact for your organization, especially when it comes to sales training. Whether you want to help new sales employees develop their skill sets or strengthen the skills of your tenured team members, Sales Catalyst has proven to be an effective and engaging program for salespeople at all levels across the globe. Want to see results like the ones shown above? Contact our team about scheduling your own Sales Catalyst training. Want to experience Own The Room in action? Join us at one of our upcoming public events!